For some website owners it’s a sad fact of life that most of the time you’re only given a top level view on your site traffic and led to think everything is ok, when you clearly know it’s not. This can be damaging as not only are you blind to what the real traffic figures look like on your website, but you could also be missing out on huge opportunities to divert ‘dead’ advertising spend into channels that are actually working. There is however a quick and easy fix to this situation that will open your eyes to a different way of looking at your website traffic. One which will leave you at an advantage over your competitors as you will no longer be focusing on ‘vanity metrics’ and be able to start making decisions based on the data that really counts. Setting up an analytics filter is a simple thing to do and once you’ve done it I can 100% guarantee you’ll never want to turn it off again. Also I will pre-warn you, in some cases it can be a real car crash to look at once the data starts flowing through. In my view, not doing this, is pretty much the same as not bothering to look at your accounts because you’re scared of what you’ll find. You need to have the Google Analytics tracking code snippet installed on your website which is pretty much standard for most online businesses who want to know what’s happening with their site traffic. 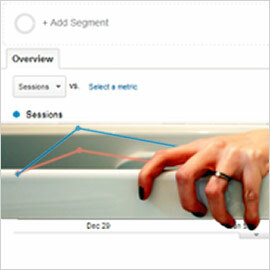 Head on over to http://www.google.com/analytics/ . In the top right of the screen you will have the option to sign in or create an account. Lots of you will already have this setup if your website has been built by someone who has even the slightest idea of what they’re doing. If so and you’re already logged into Google you should have a button in the top right that reads ‘Access Google Analytics’. A full tutorial on how to setup Google Analytics goes outside of the scope of this article as it can be different depending on your website, as well as instruction on how to do this is made available as soon as you set up your analytics account. The next step is to work out which traffic you want to filter out (that’s as long as you actually have some traffic to look at), and so you know if you don’t already, the filters will not affect historical data and will only affect data that’s come through after the filter has been set up. At a basic level this is going to come down to internal traffic from your own business, specific countries and bad referrers such as the bain of my life semalt.com which will always make an appearance on my affiliate websites. Referring sites like semalt can leave some websites with traffic stats that are just not even worth bothering looking at, along with bounce rates giving you the impression everyone is exiting your website as soon as they hit it. Another note is you can be as picky as you like with the traffic you filter. Personally I like to just weed out the worst offenders so I can get a clearer picture on what my traffic is doing. Once you’ve logged into your analytics account, look for ‘Acquisition‘ on the left hand side, if it’s not open already click that menu item to reveal the sub menu items. The site I’ve opened up shows the top two referrers are semalt.semalt.com and buttons-for-website.com . This is my tn2networks.com website. I’m still not too sure why these two bad referrers like my website so much but it doesn’t help that from the start I’ve focused on a lot of link building, so any referring sites I do have that should be there only drive a minimal amount of traffic, if I was chasing traffic rather than links I think these two would be at the bottom of the pile somewhere. If you have a well-established website you will also have a list of other websites in front of you, most of which will be sites in your niche that you recognise, like forums and industry organisations etc, these are the sites you want to keep. What you’re looking for are sites you do not recognise with a large proportion of visits and a high bounce rate. Once I find these offending websites I would just copy and paste these web addresses to a notepad file. 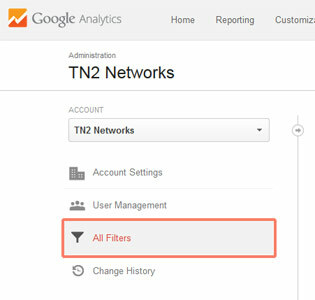 Once you know what you want to filter out, you need to head over to the admin section of Google Analytics. Before you add your filters you need to create a new view. 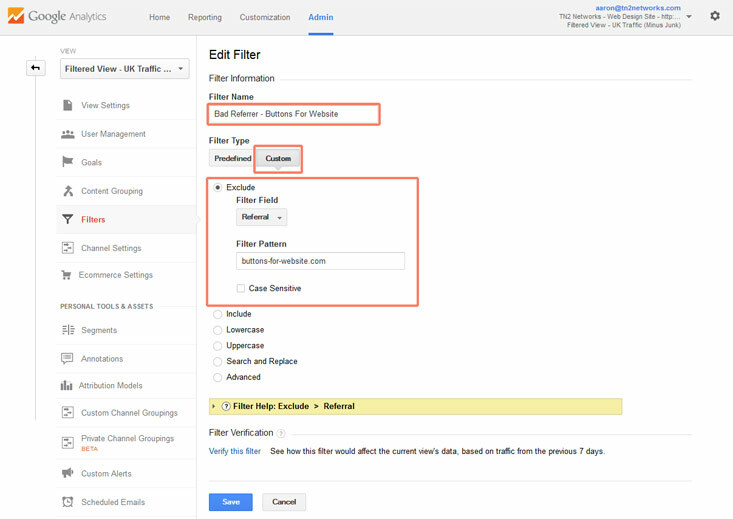 This ensures that all your current analytics data isn’t touched by the new filters you’re going to add and you can refer back to it if needed. On the next screen below for the purposes of this tutorial it’s all about website traffic, so leave ‘Website‘ selected, under ‘Reporting View Name‘ add something meaningful. For example in my case I want a view where I can look at just UK traffic, minus the junk that comes through. Then set the time zone for your view. This will leave me with just the traffic that matters, even though I do work for clients abroad most of my marketing efforts are centered around the UK. If you’re a larger organisation you can break this down how you like. So for one of my ex-employers who were dealing with the UK and the US I would potentially leave the one default view, then add two extra views, one for each country each with filters for junk traffic. That way if I did ever need to drill into just the US traffic and see how those visitors were behaving I could. Just a word of caution, if you are filtering for other countries set the time-zones accordingly on each view. You might think this is a minor thing but to be able to tie your visitor actions to certain times of the day or week accurate to that country is extremely valuable data. The next task is to start adding your filters. As I want to preserve all my traffic data I need to add the filters directly to the view I’ve just created, so first thing is to make sure you have the correct view selected. Select the view you just created in the far right column, then once that shows as the view, click ‘Filters‘. On the next page you’ll see a big red button ‘+ NEW FILTER‘, click this to add your first filter. You will already notice I have a few in here, I’ll talk you through these as we go. You’ll also notice I go by the same convention of naming everything something meaningful, you can name everything filter 1, filter 2 etc but I’d advise against it as it’ll just make your life more difficult in the long run. IMPORTANT NOTE: At this point it’s important to note, due to the filters you’re setting up you could experience unexpected results if you’re using a mixture of include or exclude filters, or more than one of each. This is the main reason you always create a new view to attach your filters to so all of your original traffic data is still preserved. As I’m looking at an existing filter in my account below, you won’t have ‘Edit Filter‘ as the page header and it will read ‘Add Filter to View‘, just leave the radio button for ‘Create new Filter‘ (selected by default) then everything will be the same as the screenshot. Under ‘Filter Name‘ give it a meaningful name that makes sense to you. This one is pretty easy to do as it only ever showed in my reports as buttons-for-website.com, once you’re done just hit the blue ‘Save’ button at the bottom of the page and you’re done. You should be able to see how powerful this is already, as you could actually create a new view and create a new filter to only include mobile traffic to see how mobile users interact with your website. Or, as we’ll set up in a minute a filter just to show traffic from a specific country. But while we’re talking about filtering out bad referrers there’s one that deserves a heading all of it’s own. This needs a slightly different approach to the example above but it’s very easy to do. Due to semalt.com using lots of sub domains, so for example it’ll appear as 243.semalt.com, 447.semalt.com and so on I’ve taken a different approach to blocking it to catch all these variations from one filter. 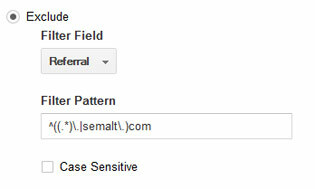 All you need to do is under the ‘Exclude‘ section and ‘Filter Pattern‘, add the following ^((.*)\.|semalt\. )com as shown above to the left. I’ve been running this filter for 6 months now and semalt.com never comes up in my analytics any more. This is definitely worth doing if your customers are mainly based in one country. 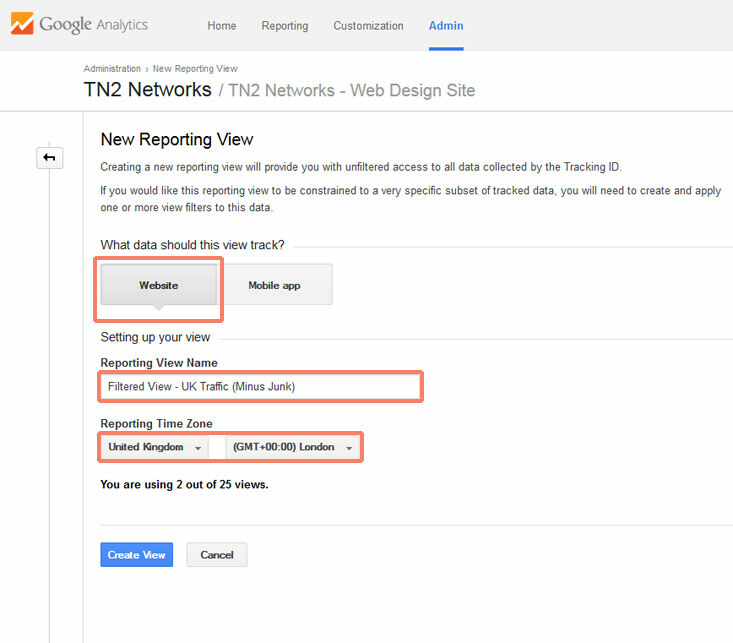 When I’m creating a new view I’ll block out all the bad referrers, then in the instance of TN2 Networks I’ll also limit my view to just UK traffic, as that’s the main country my marketing activities are tied to. If I started to generate regular new (and profitable) leads from the US I’d start to limit and investigate that traffic too with a new analytics view. 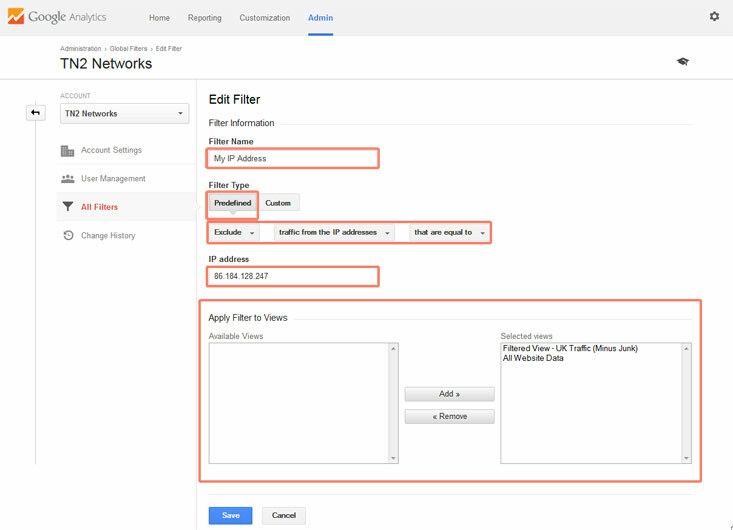 Same process, make sure the correct view you want is highlighted, add a new filter and then use the settings below. Whichever country you want to filter for you need to dig into your analytics reporting, click ‘Audience‘ in the left menu, then ‘Geo‘, then ‘Location‘ and find the same name Google uses. 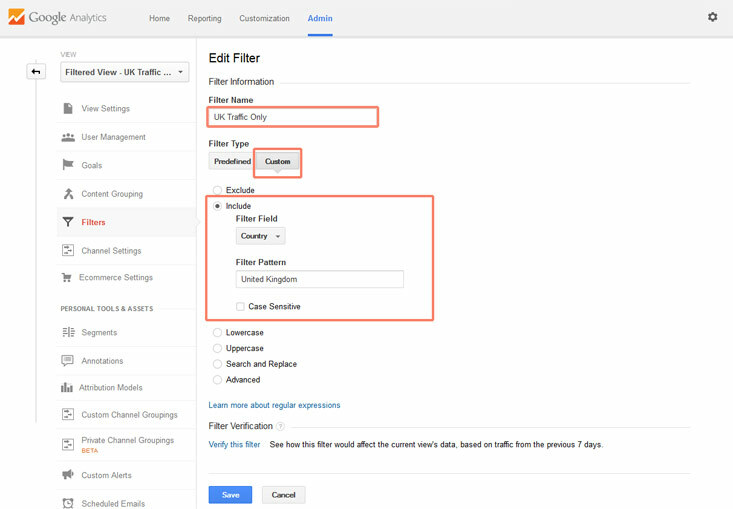 If I put ‘UK‘ in the ‘Filter Pattern‘ field Google wouldn’t know what to filter as it uses the name ‘United Kingdom‘ to identify the UK inside analytics. Especially important if you’re a web designer. If you’re anything like me I run some major testing on my client sites, different browsers, different devices. It can cause some strange traffic spikes in my analytics. There’s two simple ways to combat internal traffic showing up on your analytics and it will depend on the size of your company. For me, being a one man show, I used to filter my IP address, but not having a static IP address means every time my broadband conks out I get a new IP address and have to change my analytics filter. So I now use a blocker in all my browsers, really easy to do, just visit the following address https://tools.google.com/dlpage/gaoptout and click the big blue button, follow the instructions and you’re done. However, if you have 400 employees all in the same building it’s not practical to install this onto each and every computer and the easiest way is just to add your IP address as a filter to Google Analytics. If you would rather go down this route instead of opting out of Google Analytics for whatever reason, your first step is to type ‘what’s my IP’ into Google and it will throw your IP address up which you need to copy and add to your filter, but beware, if you don’t have a static IP you will need to re-check your IP and change it every time you lose your broadband connection or your router is turned off and on again. Also, I normally add internal IP address filters at the account level (shown left). At the time, before I used the Google Analytics Opt-Out I always needed to change my IP whenever my broadband dropped out so only wanted to do it the once across all my views. This is the only different step to applying filters at view level and you will have the option at the bottom of the screen to assign the filter to a new view so there’s no need to re-create a filter once it’s been built (see below). That hopefully will have given you enough info to start adding filters to your Analytics account for whatever you need. Completely optional, and something I’ll always do for my web design clients is set up some form of goal tracking. It’s one thing to know how much traffic you’re getting and where from. It’s another thing entirely to know exactly what is causing all your enquiries and sales. This is absolutely crucial to your success. If you’re not sure it’s always worth paying someone to do it for you. It will be the best marketing related spend you ever make. For anyone who doesn’t know as I imagine most people reading this are not web designers or marketing professionals. Goal tracking at a basic level is where an action is logged in Google Analytics, whether that’s someone completing a shopping cart process or landing on a thank you page after filling out a form. Depending on the visitor that action is then tied to all the various data about that visit which can be as detailed as location (right down to town), what device they’re using or the site that referred the customer to you. 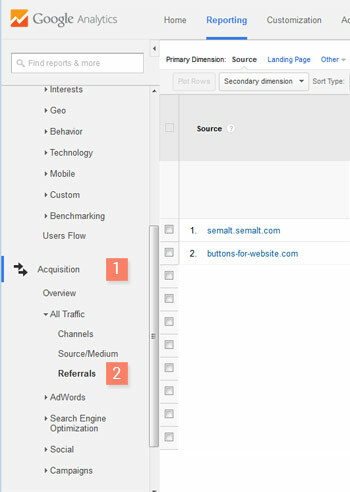 So then at a top level view you could for example log into your analytics, look at each traffic source and it will give you a breakdown of total conversions for each one. Without goal tracking you could find that Facebook brings you 1000 visits a month but Google organic traffic only registered 200 visits and without a second thought think that Google isn’t doing a very good job. If you had goal tracking set up you might actually find, Google is the traffic source driving all the sales. It does go a lot deeper than that too but hopefully its convinced you enough at the very least to start looking at goal tracking. That could be another blog post for another day but as this one goes I think it needs to be stopped now before I send someone into a coma. I don't blog often but to make sure you never miss another post, please use the sign up form above. How Hard Will it Hit Your Business?